Also, Tire Rack has done such a good job of explaining tire sizing that I doubt I could do better (not to mention how much work it is to make a new web page!). Please read it and if you want more detail, come back to this page. Here's a scan of one of the pages from the 2005 TRA Yearbook. Notice that the dimensions are in both SI units (mm) and English units (inches), however, there differences in the 2 dimensions isn't worth talking about. This is one area where all the tire standardizing organizations are in complete agreement. There are tolerances - for both new tires and tires after growth in service (yes, tires will grow a bit in service.) That's what's on page 1-35 (the note at the bottom of the page). I?m not going to post that page because of the next bullet point. 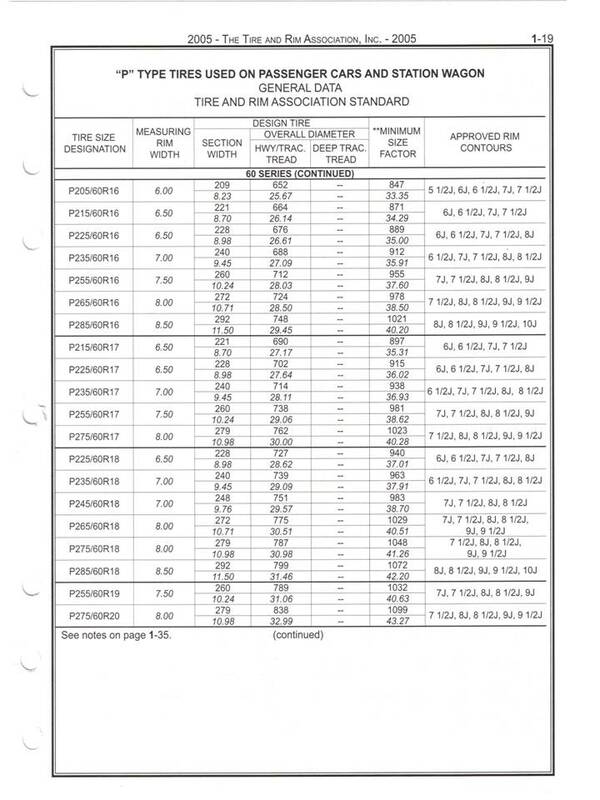 There is no requirement that a tire manufacturer has to comply with these dimensions. It would be foolish to do otherwise, so it rarely happens. Not to say there isn't some variability - there is - which is why there is no point in posting page 1-35. Occasionally a vehicle manufacturer will have a space problem and need to have a tire that is smaller in one or more dimensions. It's the European car manufacturers who seem to be the biggest perpetrators, and because their regulations regarding what is allowed to be installed are so restricted, they can pretty much have that approved. This presents problems for other tire manufacturers who are building tires to the standard dimensions. 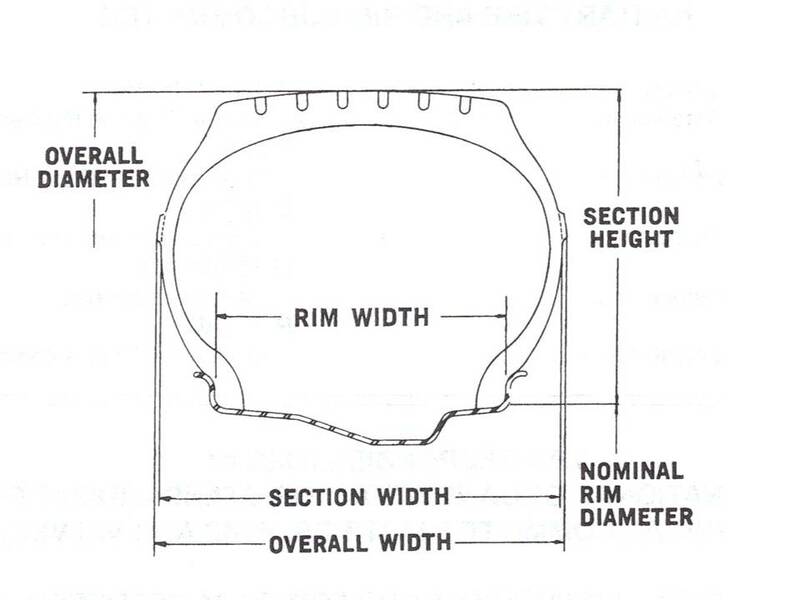 The "Design Tire Overall Diameter" - generally shortened to "Design Diameter". This is a target dimension. The "Approved Rim Contours" - although the letters are probably a mystery to most folks. The "Design Tire Section Width" is rarely the same as the "Tire Size Designation" would indicate. This is also true if you were to calculate the actual aspect ratio. This is because the "Tire Size" is adjusted to have it make sense in a bigger scheme of things - load carrying capacity. For example: If a vehicle engineer wanted to increase the size of the brakes on an existing vehicle, the tire standard allows him to use a 1" larger rim diameter with a section width 10 mm wider and an aspect ratio lower by 5 units and the result is the same overall diameter and the same load carrying capacity. Neat, huh? There is a set of overall diameters for "Highway / Traction Tread" - which generally means "All Season", "High Performance", and "All Terrain" - and a different overall diameter for "Deep Tread" - which generally means "Winter" (Snow) and "Off Road", but is sometimes used for "All Terrain" tires if appropriate. There is a "Minimum Size Factor". This is the section width and the overall diameter added together. This is intended for use by folks who want to make tires having different dimensions than indicated. The "Minimum Size Factor" ensures that there is enough air chamber volume to support the load. 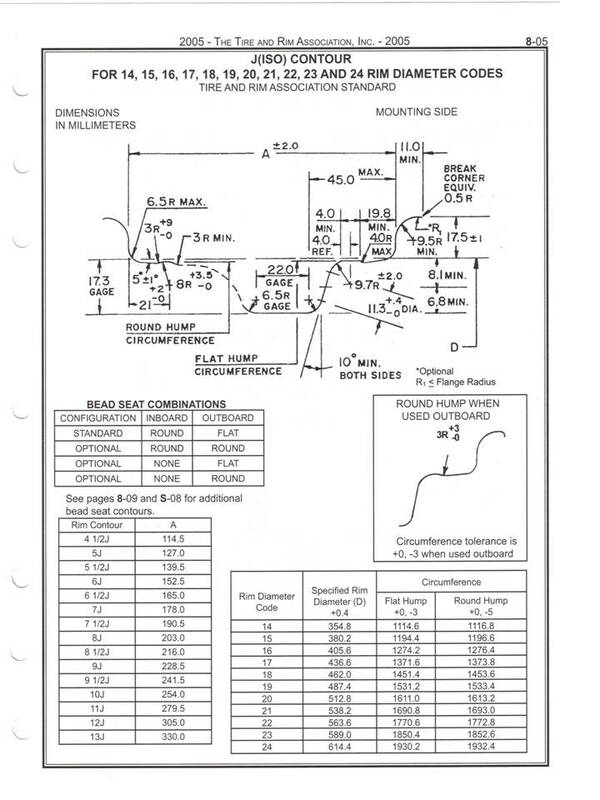 "Approved Rim Contours" refers to both a width, and a flange contour (the letter) Here's a page from the yearbook with a flange contour standard. I mentioned before that the mating surface between the tire and the rim - basically what is designated on this page is 100% specified for the rim and nothing is specified for the tire. But notice that the contour of the rim is indicated as a "J" flange. There are other pages that define other contours. This is something the vast majority of people don't have to worry as flange contours are generally grouped by type of tire - meaning type of service - so all tires used in passenger car service - for example - only have to fit certain rim flanges - and rims designed for certain types of tires can only have a certain group of rim flanges. When it comes to tire standardizing, this is one area where all the tire standardizing organizations have done a good job. All the dimensions are the same, no matter which organization's yearbook you look at. One last thing before we leave this subject. I don't know of any of these calculators that refer back to the the dimension tables in any of the yearbooks. Every one I looked at used the "dimensions" in the size and - for practical purposes - they get pretty close to the Overall Diameter listed in the yearbook. More importantly, when they compare tire diameters, the error is not worth mentioning. BUT, every calculator I have looked at has a flaw!!!! They assume the overall diameter is the same as the rolling diameter AND THIS IS NOT TRUE!!! The rolling diameter is about 3% smaller than the overall (unloaded) diameter. No, it's not the same as the loaded diameter (or better specified as the "Static Loaded Radius". This is because the tire is not only "squished" at the bottom, but it "hangs" from the top. So it's better to think of "rolling circumference". This way it's easy to understand that the belt seems to act like a tank track with the tread rubber on top of the "links" - and it is the distance between each link times the number of links, that determines the "circumference". What this means is that so long as the calculator is doing comparisons, the "3% problem" isn't a problem. - except for this tire calculator!!! Kudos, 1010Tires! !